For Brett Connolly, the first one was the hardest. 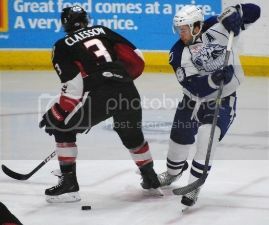 The Syracuse Crunch forward, who posted 74 points in 89 games last season, went 10 games before registering his first American Hockey League goal this year. Still, he knew it was only a matter of time before the goals would start flowing. Connolly finally broke through with a power play goal against Norfolk Dec. 6, turning months of frustration into relief. "I knew it would come around," Connolly said. "At the start of the year, things weren't going in for me, but I think, in terms of my stats, I'm right back to where I was in the first 22 games last year. Usually it works itself out." Less than one month later, Connolly is riding a seven-game point streak, including back-to-back three-point games against Toronto and Binghamton last week. The Tampa Bay Lightning's 2010 first-rounder is up to 20 points in 23 games, and is on a better point-per-game pace than last season. "I just told myself I had to get the first goal, and once I did that I'd be confident again," Connolly said. "I didn't think this weekend I'd have six points or whatever it was, but it happens. The season is a rollercoaster, there's ups and downs. You've got to ride the ups as long as you can, because it's not going to last the whole season." After watching extensive video during his slump and time in Tampa, Connolly changed some of his on-ice habits. "I think I'm doing the little things a little better," the 21-year-old said. "I'm stopping on pucks and staying above pucks. Maybe at the start of the year, I was on the wrong side of pucks a little too often." "He's playing away from the puck a lot better," said Crunch coach Rob Zettler. "He's stopping on pucks and what I call staying above pucks, and he's been rewarded for it." Connolly's recent surge also coincides with the arrival of Jon DiSalvatore, a veteran who has nine 20-plus goal seasons in the AHL. Vladislav Namestnikov, who recently returned from a hand injury, has centered the Crunch's top line. "He's a smart player, he's been in the league a long time," Connolly said of DiSalvatore. "He does the little things really well and we've found chemistry pretty quick. That makes things easier when you know where guys are going on the ice." "He seems to have worked really well with Jon DiSalvatore, who has some skill and can get him the puck," Zettler said. "And now you throw (Namestnikov) in there, who has really good speed. It seems to back off their D a little bit." Zettler had no doubt that Connolly would eventually break through in his second year in Syracuse. "The work ethic has always been there right from day one of training camp," Zettler said. "It's always been there ... He had some unbelievable chances early in the season where the goalie had an unbelievable save or he hit the post or whatever. Now it's starting to go in for him."